Jean-Claude Van Johnson Review - JCVD Is Hilarious In Self-Deprecating Winner - Are You Screening? You don’t find a lot of shows with actors playing themselves, which sounds obvious, but with Episodes and Jean-Claude Van Johnson, it may be time to start asking why that is. Although, Jean-Claude Van Johnson may have as much trouble getting people to show up in the early going as Episodes did, despite consistently being among the best shows available. Van Damme, who is no stranger to playing himself and taking a hard look at his life (see the underappreciated JCVD), takes on the role of himself in Jean-Claude Van Johnson. In Van Johnson, Van Damme plays the fictionalized (let’s say) version of himself who spent his life making bad, or at least questionable, movies as a cover for his true work as a spy. Now out of the game, he’s hopelessly bored, but when he runs into an old flame, and ex-partner in the spy game, he wants back on the job. The only problem is… he’s old. Really old. You know, for a spy. Whatever that might lead you to expect, and I can’t guess what that might be, Van Johnson isn’t it. That’s a double-edged sword for a show hoping to snag an audience, because people have trouble tuning in when they can’t guess what’s coming, even if it’s brilliant. 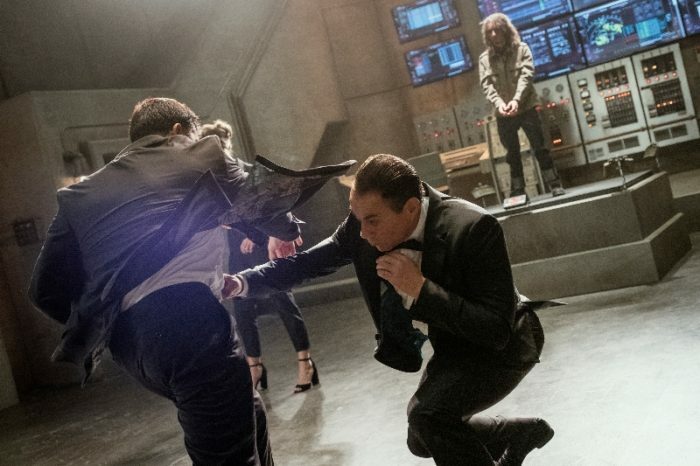 Worse, there are no real hints, apart from what you might glean from the trailer, because the writing crew offers you no better clue than Van Damme’s martial arts past does. Not because they aren’t good writers, or Van Damme’s past films aren’t (Bloodsport is a good movie! ), but because they have largely worked on dramas, incomparable comedies, and/or not all that much. Van Johnson, for all its effort at weaving itself around spy shenanigans, is ultimately a glorious, hyperbolic soliloquy offered up by someone trying to come to terms with themselves. Along the way, we watch Van Damme tilt at his windmills, mock the action genre in general, and begrudgingly reminisce about the curiosities of the game (“When I made Looper and called it Timecop everyone thought it was stupid, but put Bruce Willis in it…”). Sometimes, it’s all three (and more) at once. When not directly taking aim at Van Damme, or perhaps aging action stars more generally, the show takes its shots at the industry, such as when a vaping, hipster director tells Van Damme what fighting is and is not realistic. 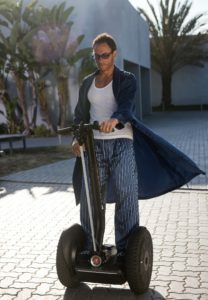 Connecting us more directly to the past is Vanessa (Kat Foster), Van Johnson’s “one that got away,” who has him on the hook as he looks for something beyond Segway-ing to his morning paper and wandering aimlessly in a mansion in which everything is branded “JCVD”. Vanessa is the show’s one note that is not (always) delivered in hyperbole, which only highlights the extremes of everything surrounding her. She becomes the reality in a whirlwind that pulls you along through the cleverly-couched honesty that is almost lost in the jovial excess. It’s hard to talk about Van Johnson without immediately giving him credit for being able to laugh at himself, and I’m betting most everyone will say exactly that, but I think that isn’t quite what he’s doing, nor is it precisely what this show should get credit for. There is a lesser version of this idea somewhere, and in that one he, “makes fun of himself,” or, “is able to laugh at himself,” but what we really get here is something closer to just acceptance. Thus, I think, the hyperbole of it all. This is really just Van Damme laughing, and he happens to be talking about himself. I’ll grant you it’s a tricky distinction. Perhaps best of all (the show’s clever comedy notwithstanding), Van Johnson feels like something born out of need for a cathartic expression, and that’s where you get some of your best shows (The IT Crowd anyone? ).